One-Pot Meals, 5-Ingredients Simple. You already know that your Dutch oven is the ultimate secret weapon for simple meals—but what if cooking could be made even simpler? The 5-Ingredient Dutch Oven Cookbook delivers extreme ease to mouthwatering meals. 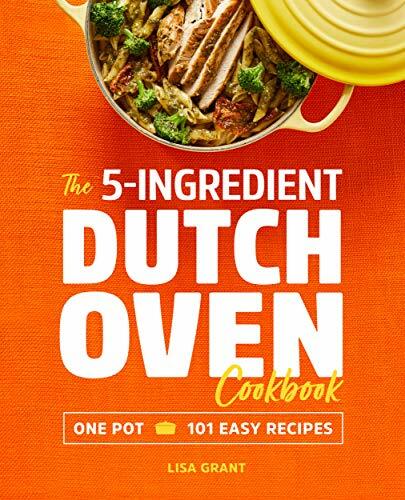 Using just five fresh, flavorful ingredients, this Dutch oven cookbook serves up recipes without all of the prep and clean-up stress that tend to get in way of good homemade cooking. Start off your morning with Cinnamon French Toast Casserole or watch your family rush to the dinner table for a Barbecue Beef Brisket that sends taste buds soaring. One thing is for sure: whatever you’re in the mood for, it’s going to be tasty and easy. Inside The 5-Ingredient Dutch Oven Cookbook, you’ll find: The Bible for Dutch Oven Cooking—Learn everything you need to know to make homemade cooking a breeze with this Dutch oven cookbook. 5-Ingredient Recipes—Make grocery shopping and cooking a snap with easy-to-find ingredients (your one-pot wonder can do the rest of the heavy lifting). Family-Friendly Meals—Whether you serve up classic favorites like Sloppy Joes or mix things up with Teriyaki-Glazed Salmon, this Dutch oven cookbook has you covered for breakfast, lunch, dinner—and don’t worry—dessert, too. Dutch ovens have helped generations of home cooks serve up simply delicious, homestyle meals. Tonight, delicious just got 5-ingredients simpler.